Review: An Italian language biopic of the last day of Italian filmmaker Pier Paolo Pasolini in 1975. I was particularly impressed with Willem Dafoe’s performance. Thought he did an incredible job. I enjoyed hearing the two languages, English and Italian and thought it worked really well. 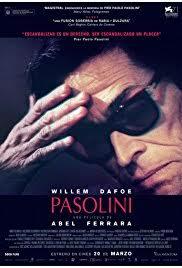 If you don’t know anything about Pasolini then the film will have little impact on you. I was totally amazed by the whole film.